Attention Gala Attendees: We've added a FAQ and will be updating it as we get closer to the show date. Now in our 35th year, this year we’re celebrating the untapped potential of our beneficiaries, and the power of that potential to make dreams come true. The people we serve in India live with poverty and discrimination every day of their lives, and often are never exposed to what is possible. We work toward providing access to education, basic healthcare, and independence and safety for women. We believe that with the right tools, we can help empower those marginalized by society. By nurturing potential we are ultimately harvesting dreams. Our annual Gala is not just a celebration of the people we serve. It’s also a time to honor those who have made it possible to transform the lives of thousands of people: YOU. It’s because of you that we have been able to expand our programs and assist more beneficiaries in more locations. We hope you will join us for an evening of dance and celebration on Saturday, September 30, 2017. 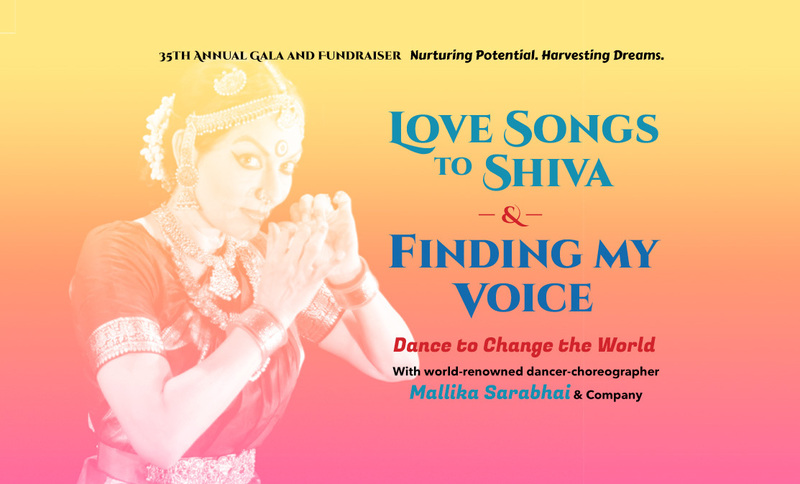 For this year’s show, we are proud to announce two spectacular dance productions from Mallika Sarabhai & Company. 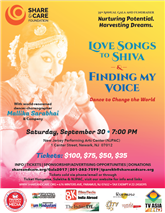 “Love Songs to Shiva” and “Finding My Voice” blend classical and contemporary Bharatanatyam, a traditional art form that reflects the culture of India at its best. Mallika Sarabhai is a modern legend as a dancer, choreographer, thespian, writer, publisher, filmmaker, and more. Tickets are on sale now, and you can find links to purchase below. By purchasing a ticket, you will be supporting our continuous mission to help underprivileged individuals break the cycle of poverty. Please join us in nurturing potential, and harvesting dreams. If you have any questions about the event, please watch this page as we’ll be adding more information as it becomes available. You may also contact us at 201-262-7599. We look forward to spending the evening of September 30 with you. If you are unable to attend, we hope you’ll consider supporting our programs with a one-time or recurring gift. As we near the big day, we’ll update our FAQ as often as needed to keep you informed. If you have any questions not answered here, please let us know at 201-262-7599. Our weather widget at right shows the weather for Newark four days out (start checking Tuesday, Sept. 26 for the Gala night forecast). A cool feature: You can hover over the widget to see additional information, and can click on the Rain and Wind tabs for specific information on each. You may also visit: Weather Channel Current Forecast. Q: Can I buy tickets on the day of the show (Saturday 9/30)? All tickets (all price-levels) will be available for sale at the venue from 6pm to 6:30pm. The show begins at 7pm. Entrance to the show is at 6:30pm. For entry to gate/box office and the outside lobby, doors open at 6pm. To pick up prepaid tickets, please arrive at 6pm to avoid delays. Q: Where can I see the NJPAC seating chart? A: You can view and/or download the seating chart as a PDF. Q: How do I get to NJPAC? A: The New Jersey Performing Arts Center (NJPAC) is located at 1 Center Street, Newark, NJ 07102. Click “Directions” to access directions from your location. A: Yes, Indian snacks will be available for purchase. A: Nearby parking at NJPAC is $28 or less, depending on the event. According to NJPAC, your car is in good hands in the convenient parking garage under Military Park (directly opposite NJPAC) or in the safe and secure NJPAC parking lots A and C.
Advance parking may be purchased online at njpac.org or by visiting the NJPAC Box Office at 1 Center Street. Although NJPAC recommends arranging for parking ahead of time, day-of visitors have the option to use self-service pay stations at various locations in Military Park Garage or to purchase parking at the Box Office. Click here for additional parking information from NJPAC. You can also try Parkopedia or Parkwhiz for more options and help. Online ticket sales are closed. All price level tickets will be available via Share & Care at box office and front lobby tables as you enter starting at 6:00 PM on Saturday. Share & Care’s yearly Gala event is a must-attend experience, one you’ll never forget. Last year’s show raised more than $1,000,000 to help the underprivileged women and children of rural India. We hope we’ll see you there.